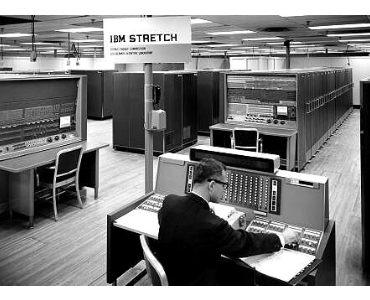 This view of the STRETCH (IBM 7030 Data Processing System) probably shows the machine in 1960 or early 1961 prior to its shipment from IBM's development facility in Poughkeepsie, N.Y., to the Los Alamos Scientific Laboratory in New Mexico. The Lab, operated by the University of California for the U.S. Atomic Energy Commission, acquired the computer for research in nuclear and thermonuclear energy. The operator's console (foreground) was used to control and monitor the system, the central processing unit (foreground) was the computer's heart, and the Exchange (left) provided a new level of efficiency in handling input/output devices -- and was able to control a peak flow of 800,000 characters of information a second.